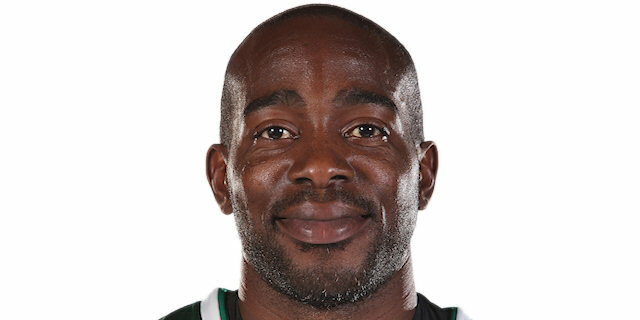 Panathinaikos Athens forced a decisive Game 5 in its best-of-five playoffs series with CSKA Moscow with a 73-72 overtime victory on Wednesday night at Olympic Sports Center in Athens. The hosts led by 9 late in the fourth quarter, but Sonny Weems almost single-handedly carried CSKA back and Vitaly Fridzon made a last-second shot with his foot on the three-point line to force overtime. After a big Antonis Fotsis three tied it for the hosts, Dimitris Diamantidis put the Greens up 2 from the line with 8.4 seconds left. 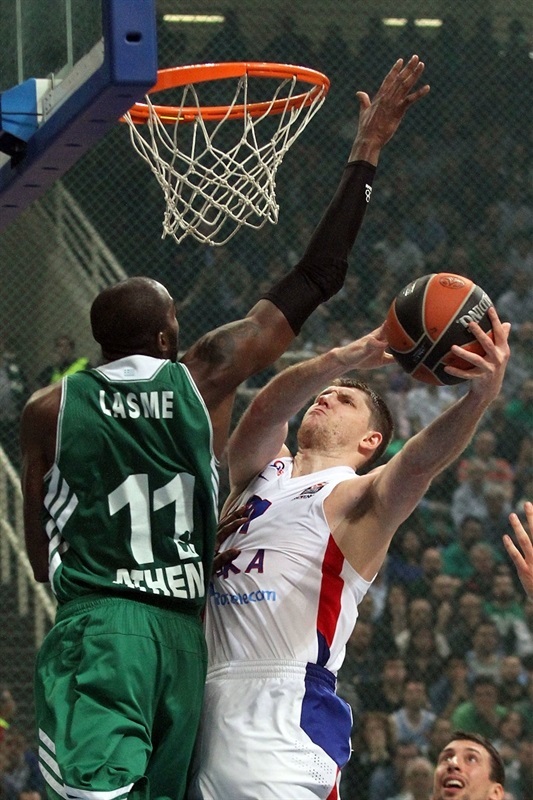 CSKA had two last chances to tie it – or take the lead – but Weems split free throws and then stepped out of bounds on an inbounds play to leave the win for Athens. Jonas Maciulis paced the winners with 15 points, Stephane Lasme scored 14, James Gist 12 and Loukas Mavrokefalides 10, while Diamantidis dished 6 assists for the Greens. 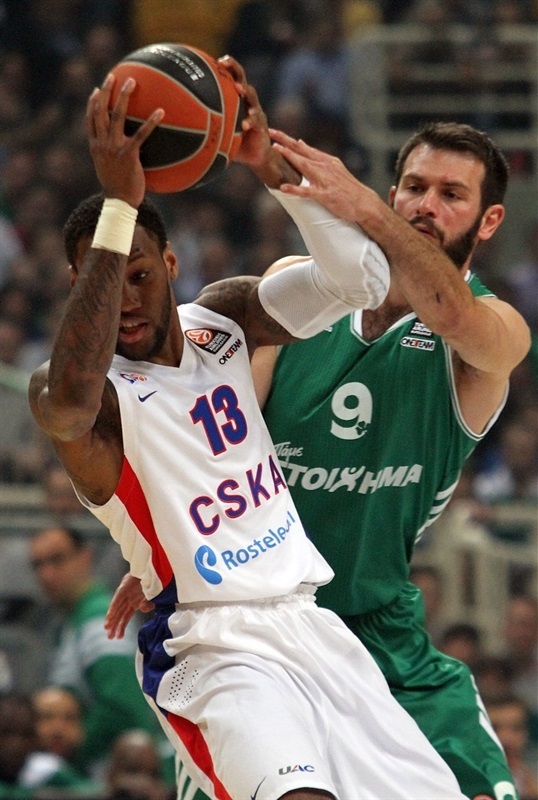 Vladimir Micov led CSKA with 15 points, Sonny Weems finished with 14 and Sasha Kaun scored 11 in defeat. 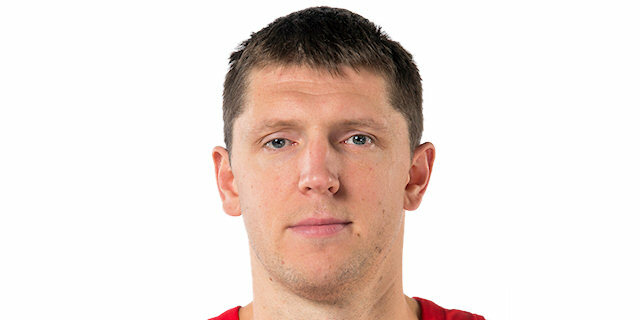 In a physical opening minutes, Andrey Vorontsevich opened the scoring with free throws for CSKA. Maciulis hit a jumper for the Greens’ first basket. Kaun and Lasme traded emphatic dunks. Miscues on the offensive end for CSKA and a Maciulis layup gave the hosts a 7-4 edge. 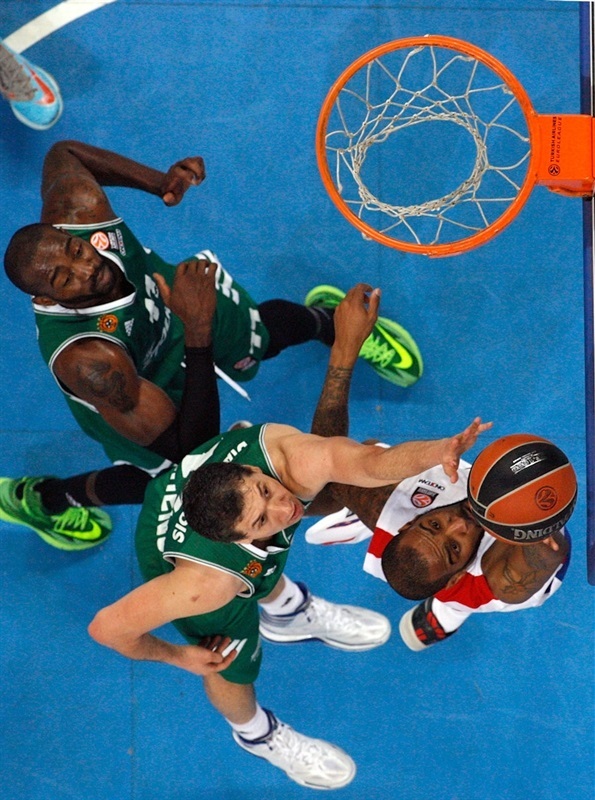 A red-hot Maciulis buried a three that doubled the Panathinaikos advantage. Kaun scored in the paint to close the gap to 10-6 midway through the quarter. Lasme rejected Micov and Fotsis followed with a three. Kaun and Maciulis remained their respective teams’ go-to men. Lasme extended the difference to 9 with a fast-break slam. Victor Khryapa twisted underneath to become the first player not named Kaun to make a basket for CSKA. Fridzon nailed a triple and finished a fast break with a basket-plus-foul as CSKA clawed its way back to 21-16 through 10 minutes. Kyle Hines sank a jumper and a minute later Aaron Jackson knocked down a three to tie the game. Gist put the Greens back in front with a three-point play that also send Nenad Krstic to the bench with 2 fouls a minute after Hines committed his second foul. Micov and Weems nudged CSKA ahead 24-25 with free throws. Ramel Curry used a nifty move to for Panathinaikos; Micov countered from the line as the lead switched hands. Gist rose high for a two-handed dunk, but Kaun stood in his way for a remarkable block. Jeremy Pargo sank a jumper at the other end. 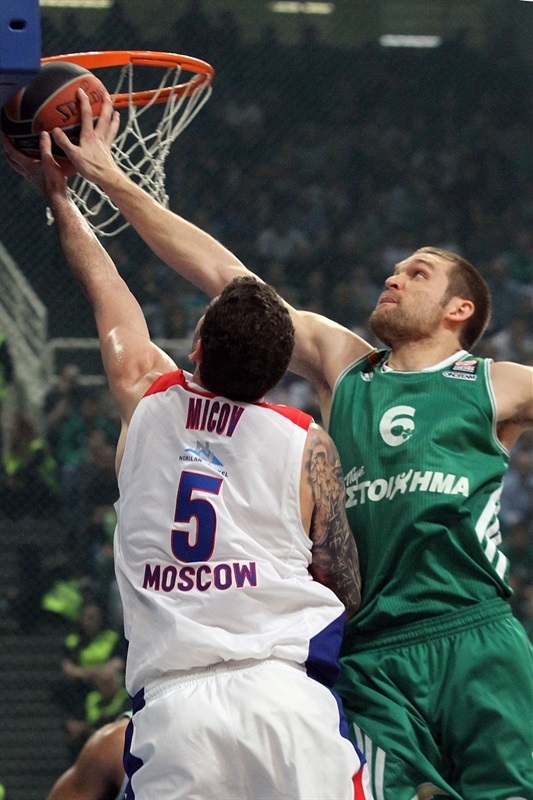 The lead continued to sway as Diamantidis sank free throws and Micov a three-pointer. Gist tied the game at 32-32 only to see Pargo drain an open three. Pargo threw Kaun an alley-oop, which also drew Maciulis’s third foul. Kaun made the free throw for a 32-38 CSKA lead. Panathinaikos came back on Mavrokefalides free throws and a Gist three-pointer to make it 37-38 at the break. 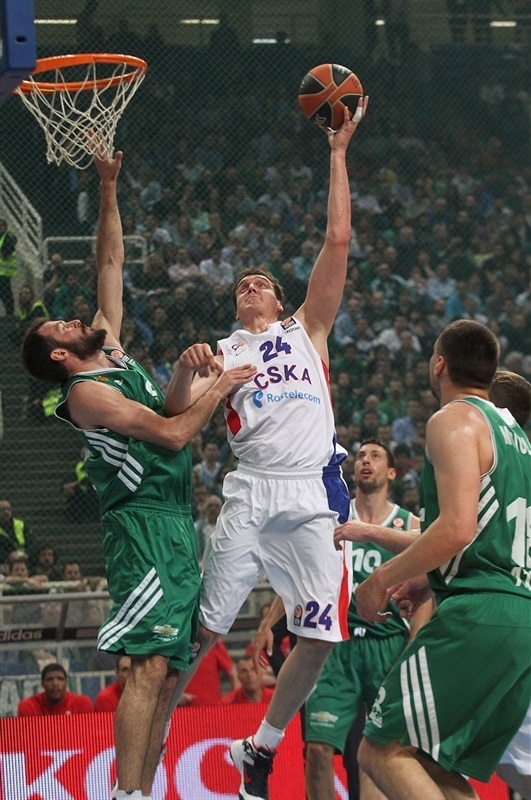 Vorontsevich connected from deep before Jackson matched CSKA’s biggest lead from the first half, 6 points. Back-to-back threes from Diamantidis and Maciulis tied the game at 43-43. The arena was back in song as Lasme converted a three-point play. Kaun revived the visitors with 2 free throws. CSKA turned to its big lineup with Krstic and Kaun inside and Khryapa at small forward. A Jackson layup put Moscow up 46-47, but Roko Ukic’s first points and a Maciulis triple put the Greens back in charge. Krstic picked up his first point by splitting free throws to make it 51-48. Micov scored a three over Ukic to tie the game. 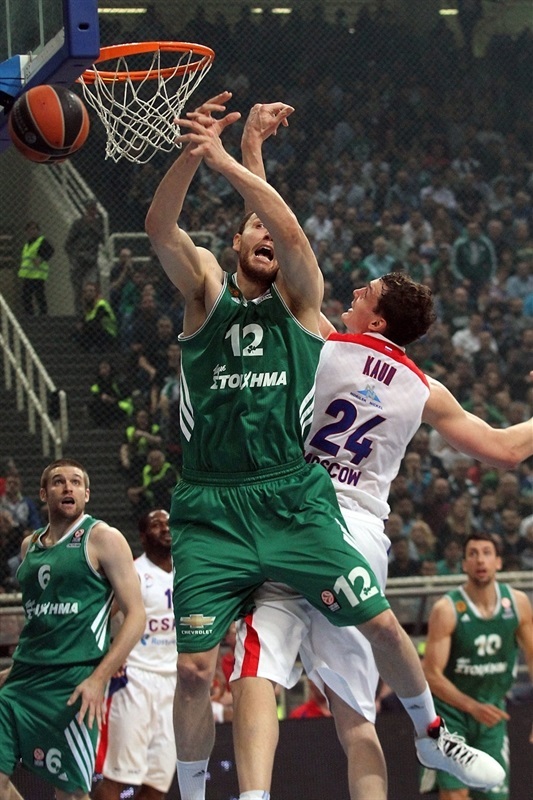 An aggressive foul by Vorontsevich on Gist allowed the Greens to regain control. Gist made the free throws and Mavrokefalides capitalized on the extra possession. The center scored the next two baskets as the lead reached 59-51 and the din reached ear-splitting levels in Athens. After a CSKA timeout, Micov scored a three for his team’s first basket in nearly three minutes. After Mavrokefalides scored inside, a monster two-handed slam by Gist extended the difference to 63-54 and gave the hosts reasons to think about a Game 5. Weems connected from behind the arc twice to bring CSKA back within 3 with 1:40 remaining. After a pair of misses from the Greens, Weems’s long jumper made it a 1-point game with 42.3 seconds to go. Panathinaikos wound the clock down and Mike Bramos missed a three with 11 second left, but Ukic was first to the offensive rebound, Panathinikoas kept the ball alive and CSKA finally fouled Ukic with 2.9 seconds left. He split the free throws and CSKA had one last shot. Fridzon managed to get a shot off with a foot on the three-point line to tie the game at 64-64 with 0.1 seconds left, essentially forcing overtime. Weems split free throws a minute into the extra session. A Lasme score on the offensive glass made it 66-65, but Micov answered quickly. 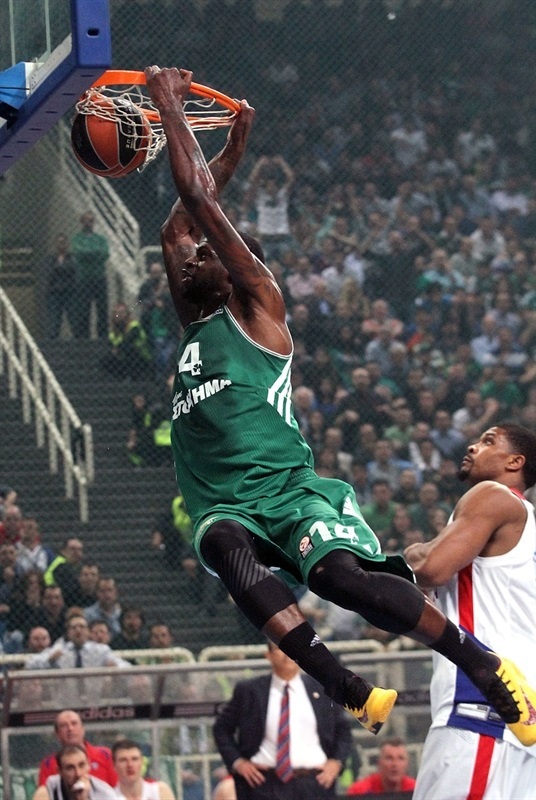 Panathinaikos went cold from outside, but strong defense kept the teams close. 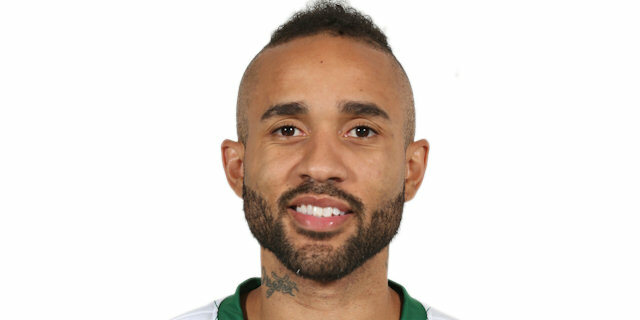 Lasme was fouled by Weems with 1:30 left in the session and put the Greens up 1 with free throws. Aaron Jackson did the same for CSKA 8 seconds later. Weems drove the lane to make it 69-71 with 47.9 seconds on the clock. After a timeout, the arena erupted as Fotsis hit a clutch triple. 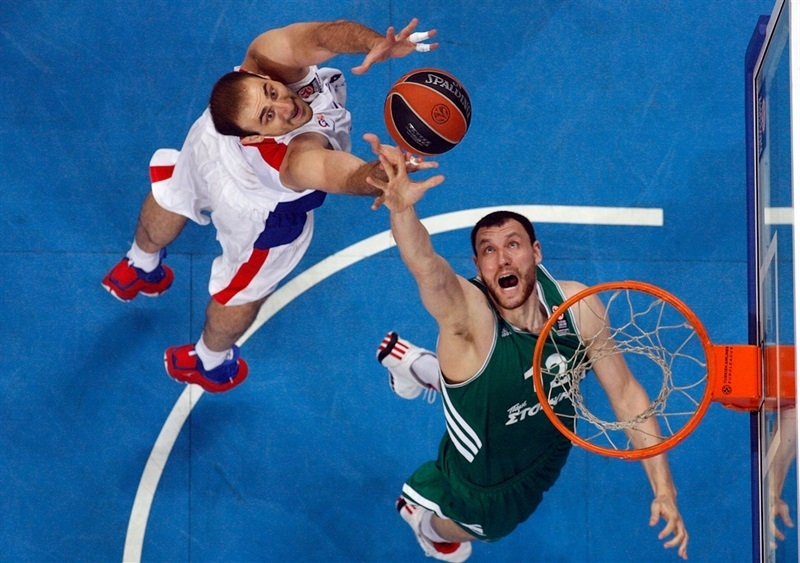 Diamantidis put Panathinaikos in front with a pair of free throws with 8.4 seconds left. CSKA went to Weems, who attacked the basket and drew a foul with 4.7 seconds to go. Weems made the first and missed the second, but Diamantidis dropped the rebound out of bounds with 2.0 seconds remaining. 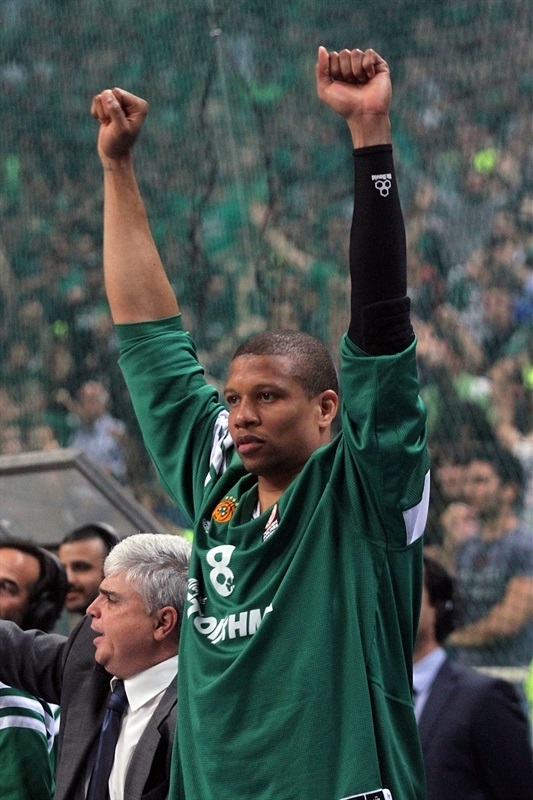 However Weems stepped out of bounds while receiving the inbounds pass and Panathinaikos started to celebrate. "We did what exactly we were aiming for; tie the series and go back to Moscow. It was a thrilling game, which gave us more confidence. Game 5 will be very tough, but we will go there to play with a big heart and maximum competiveness. Tonight was a real fight and we had the chance to win in regulation, but we missed some shots. I know the guys and I trust them, because they have character and play with heart, motivation and passion to achieve their goals. There is enough talent here, both in defense and offense. Bramos and Curry are 1 for 22 so far from behind the arc, but they do other things and it is unfair to blame them for this low shooting percentage. I know that no team in Euroelague history came back from 0-2, but I don’t care for tradition and statistics. We have to give a fight there and we will do so." "It was a very tough game for both teams. 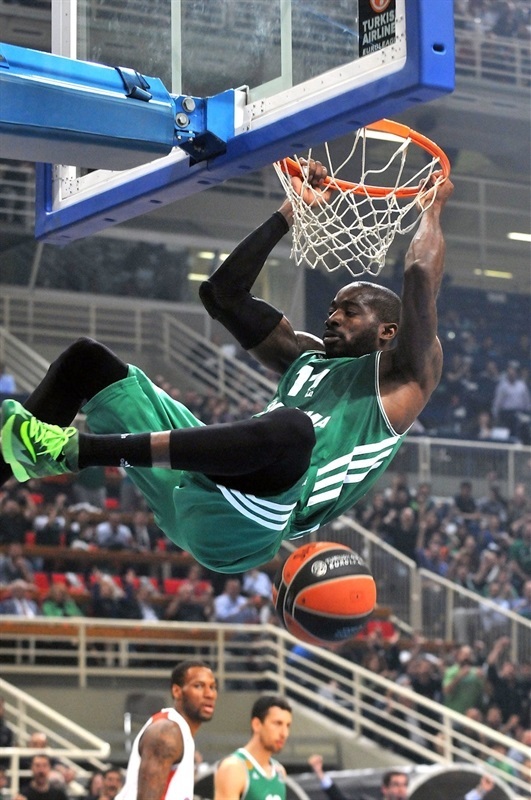 Congratulations to Panathinaikos on their win and I think that they can edge every team. There is no time for a long analysis as we have to get prepared for Game 5. I didn't expect to have easy games here. We lost Game 3 by 6 points and tonight by 1 after overtime. We miss Milos Teodosic, who is a key player for us, but I don't want to talk about that. We will return to Moscow and we will study his status to know if he can play on Friday." "We keep trusting ourselves and we would like to pay back our fans for their outstanding support. I want to congratulate Sonny Weems, because he is a great player and kept his team alive. Panathinaikos used to play great defense, maybe the best in Europe. Now we are going back to Moscow for Game 5 and I hope that we will play it our way. " "I am very happy and proud of what we did tonight. I didn’t play well, but that doesn’t matter. It is a great win and now let’s go to Moscow for Game 5. " "Unfortunately we didn’t make it at the end. We forced the overtime and we had an advantage, but it didn’t happen. We made bad decisions and I feel guilty for the loss, because Panathinaikos took advantage and won the game. Both teams are exhausted from the consecutive games and everything will be decided by the team that wants it most."